Above you can see a screenshot of my dashboard (click the picture to see its full size version). 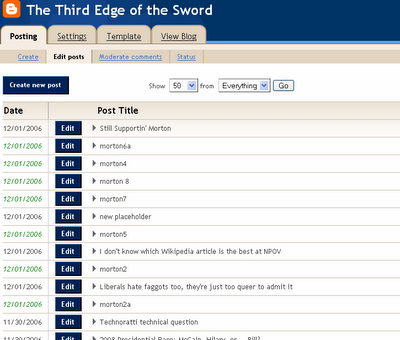 All of the draft posts ("morton1", "morton2", etc.) were created in between "Technoratti Technical Question" and "new placeholder". "I don't know which Wikipedia article is the best at NPOV" was the first draft post converted into a real one, and "Liberals hate faggots too, they're just too queer to admit it" was the second. Yet in each case I started by choosing the draft entry furthest back in time (that is, the one lowest down on the list). Why on earth do they move around in the listing when posted? They were all created at different times. There is no alphabetical order in how these posts end up being switched. "new placeholder" even kept the exact same name! This is the sort of quirks that Blogger needs to address one fine day. (Today is not a fine day in Edmonton, but in Mountain View, California Google HQ is experiencing a pretty decent afternoon: +17 Celcius with an 8 km/h wind and mainly clear skies. Feel free to fix these bugs while I endure frozen wastelands, boys! Isn't he one of Arar's terrorist buddies? 47 living rooms! I like it!